My obsession with chili continues with this Low Carb Chili recipe. We first gave you Chili With Bacon, but now have moved away from ground beef to tender chunks of chicken breast. Watch me walk you through how to make it below! As you can see in the video above, all I do is partially cook the bacon and chicken and then toss in the rest of the ingredients. Once everything is combined you just have to allow it to reduce. During the reduction process all the flavors become more concentrated and all the veggies cook down into the meats and broth. It's really the easiest dinner to make for a large family gathering or even just for one, with leftovers for the next day! And, by adding soy beans everyone will be left feeling satisfied none the wiser that it's low carb. Adding bacon to meals is always an option and probably the best decision you can make. It not only ups the fat in the recipe, but gives a huge boost of flavor. Bacon is essential to a delicious low carb chili! In this recipe we kept it respectable by adding 3 pieces of bacon for a four serving recipe - please don't let that hold you back from amping up the bacon to chili ratio. The more bacon the merrier. In this chili recipe we added in a can of soy beans for some substance and to give you the real chili feel! Some of you may not like to incorporate soy and if that is the case please feel free to omit them - it will be just as satisfying without the beans! However, this is our only recipe with soy beans as we like to incorporate them minimally when possible. 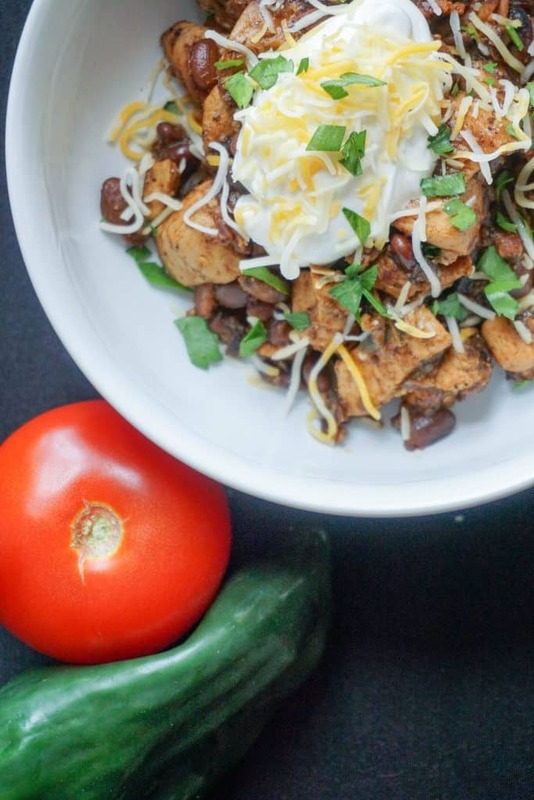 If you do like the idea of using soy beans, which are high in fiber, a great place to add them would be in our Low Carb Breakfast Bowl and Pork Rind Nachos. But, before anything make this low carb chili recipe! Recipe can be quickly added to MyFitnessPal - Search "KetoConnect - Low Carb Chili"
Roughly chop bacon and add to medium heat large skillet/saucepan/dutch oven and cook half way. As your bacon is cooking cut your chicken in to bite sized chunks and add it to the skillet once the bacon is partially cooked. While the chicken and bacon are cooking, roughly mince the garlic, tomato, pablano pepper and onion. Once the chicken in partially cooked add the minced ingredients and combine. Drain the can of beans and add them to the skillet along with the chili powder, cumin, oregano, salt, black pepper, chicken broth and Worcestershire sauce. Combine. Place a lid over the skillet and allow to cook for 50 minutes. At this point everything will be cooked down completely and ready to eat. If you would like a thicker chili (as seen in our recipe video) remove the lid and cook for an additional 15-20 minutes to create a thicker consistency. Serve hot with a dollop of sour cream and cheese. Enjoy!